Next Saturday's general election is a major popularity test case for a majority of the National Assembly members. The election of the 479 members of the Ninth National Assembly will take place on Saturday, February 16, in all the 109 Senatorial Districts and 360 federal constituencies across the federation. It is the same day the presidential poll will also hold across the length and breadth of the country in line with the time table released last year by the electoral umpire, the Independent National Electoral Commission (INEC). While some if not most of the federal lawmakers won the return tickets of their respective parties, others were not as fortunate as they lost out during the party primaries held between September and October last year. Some others including eight Senators were lucky to have won the primaries to fly the gubernatorial tickets in their respective states and their election will be due on Saturday, March 2. 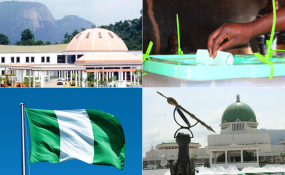 However, there are 66 senators, who would test their popularity among the electorate and they are picked from the different political parties, including the ruling All Progressives Congress (APC), Peoples Democratic Party (PDP), All Progressives Grand Alliance (APGA), Social Democratic Party (SDP), African Democratic Congress (ADC) and Peoples Redemption Party (PRP). Specifically, the Senators contesting on the platform of the opposition PDP are the Senate President, Dr. Bukola Saraki (Kwara Central); Deputy Senate President Ike Ekweremadu (Enugu West); Senate Minority Leader, Abiodun Olujimi (Ekiti South); Deputy Minority Leader, Emmanuel Bwacha (Taraba South) and Minority Whip, Philip Tanimu Aduda (FCT). Others are Senators Duro Faseyi (Ekiti North), Rafiu Ibrahim (Kwara South), Atai Aidoko (Kogi East), Ahmed Ogembe (Kogi Central), Dino Melaye (Kogi West), Suleiman Adokwe (Nasarawa South), Obinna Ogba (Ebonyi Central), Sam Egwu (Ebonyi North), Chukwuka Utazi (Enugu North), Stella Oduah (Anambra North), Mao Ohuanbunwa (Abia North) Theodore Orji (Abia Central) and Eyinnaya Abaribe (Abia South). Also re-contesting on the PDP platform are Senators Albert Bassey Akpan (Akwa Ibom North East), Gebshom Bassey (Cross River North), Rose Oko (Cross River South), James Manager (Delta South), Peter Nwaoboshi (Delta North), Mathew Urhoghide (Edo South) and Clifford Ordia (Edo Central). Re-contesting PDP Senators from the North East and North West are Mohammed Hassan (Yobe South), Isa Misau (Bauchi South), Suleiman Nazif (Bauchi North), Ibrahim Abdullahi Danbaba (Sokoto Central), Ubali Shittu (Jigawa North), Danjuma La'ah (Kaduna South), Suleiman Hunkuyi (Kaduna North) and Rabiu Musa Kwankwaso (Kano Central). Flying the APC flag for re-election are the Senate Leader, Ahmed Lawan (Yobe North), Deputy Senate Leader, Bala Ibn Na'Allah (Kebbi south) and Deputy Whip of the Senate, Francis Alimekhena (Edo North). Others are Senators Oluremi Tinubu (Lagos Central), Adeola Olamilekan (Lagos West), Tayo Alasoadura (Ondo central), Ajayi Boroffice (Ondo North), Yele Omogunwa (Ondo South), Abdulfatah Buhari (Oyo North), David Umoru (Niger East), Aliyu Sabi Abdullahi (Niger North), George Akume (Benue North west) and Abdullahi Adamu (Nasarawa west). From North East and North West on the APC platform are Senators Ali Ndume (Borno South), Abubakar Kyari (Borno North), Binta Garba Masi (Adamawa North), Yusuf Abubakar Yusuf (Taraba Central), Danjuma Goje (Gombe Central) and Lawan Yahaya Gumau (Bauchi South). Others are Ahmed Baba Kaita (Katsina North), Ibrahim Gobir (Sokoto East), Aliyu Wammako (Sokoto South), Jibrin Barau (Kano North), Kabiru Gaya (Kano South), Abdullahi Yahaya (Kebbi North) and Mohammed Gumel (Jigawa North). Those contesting on the platforms of other parties are Senators Victor Umeh (APGA Anambra Central), Monsurat Sunmonu (ADC Oyo Central), Shehu Sani (PRP Kaduna Central) and Barnabas Gemade (SDP Benue North East). Some of the ranking Senators are already scheming to be principal officers of the Ninth Senate despite the fact that they are yet to be re-elected. The Senate President, Dr. Bukola Saraki, who is seeking re-election into the Senate for the third time after serving as a two-term governor of Kwara State from 2003 to 2011 is keen on returning as Senate President and Chairman of the National Assembly. Although he may be re-elected as Kwara Central Senator, because of his firm hold on the politics of his home state and has support that cuts across party lines among the Senators, there are other Senators, who are up in arms against him. They include Senators Ahmad Lawan (Yobe North) and Ali Ndume (Borrno South), one of whom the ruling party (APC) is banking on to become the Senate President if the party still controls the majority after the February 16 election. Though the outcome of the Saturday poll would not change the present membership and power configuration in the Senate, it would definitely determine the configuration of the 9th Senate in June. No fewer than 251 out of the 360 lawmakers in the House of Representatives are seeking re-election into the Green Chamber of the National Assembly. They include the longest serving member of the House, 59-year old Hon. Nicholas Ebomo Mutu, who was first elected to the House in 1999 on the platform of the PDP to represent Bomadi/Patani federal constituency of Delta State at the age of 39. He had since been re-elected for a record five times. There is also Hon Femi Gbajabiamila, the Leader of the House, who has also been in the House since 2003 representing Surulere 1 federal constituency of Lagos State under the APC. He came in when he was 40 and has always been returned at successive elections. He enjoys massive support from his constituents, who consider him mature enough to become the Speaker of the Ninth assembly. How such interest will play out if he was re-elected for the fifth time may be a dicey thing as the Speaker of the House of Representatives, Hon. Yakubu Dogara, is also in the race. He is also seeking re-election for the fourth time since 2007 and equally has the support of his constituents in Bogoro/Dass/Tafawa Balewa federal constituency of Bauchi State. In fact, they requested that he should return to House. His backers are also of the opinions that he could still return as the Speaker if he won his re-election. The Minority Leader, Hon Leo Ogor, representing Isoko North/Isoko South federal constituency of Delta State has also been in the House since 2003. A ranking PDP legislator, Ogor is one of the most outspoken members of the house. There are also Hon. Yakubu Barde of the PDP in Kaduna, who has been around since 2003, representing Chikun/Kajuru federal constituency, and Hon. Kabiru Marafa Achida (APC, Sokoto) who came to the House of Representatives in 2003 and has won his re-election since then. He represents Wurno/Rabah federal constituency. However, while a significant number of the lawmakers were unable to secure their return tickets due to political intrigues, most others who got the confidence and support of their party members during last year's party primaries would have the privilege of slugging it out during the election. In Abia State for example, Hon. Prestige Ossy (Aba North/South, APGA), Hon. Uko Nkole (Arochukwu/Ohafia, PDP), Hon. Darlinton Nwokocha (Isiala Ngwa North/South, PDP), Hon. Onyejeocha Nkeiruka (Isuikwato/Umunneochi, PDP), Hon. Samuel Onuigbo (Ikwuano/Umuahia North/South, PDP), Hon. Nkem Uzoma (Ukwa East/Ukwa West, PDP), and Hon. Solomon Adaelu (Obingwa/Osisioma/Ugbunagbo, PDP) are most favoured to return with their experience if re-elected at the polls. Adamawa state parades among others, a very experienced Chairman of the House Committee on Media and Public Affairs, Hon. Abdulrazak Namdas (Jada/Ganye/Mayo Belwa/Toungo, APC). He is fingered as one of the lawmakers eyeing the speakership if re-elected. Other serving lawmakers in the race are Hon. Yusuf Buba (Hong/Gombi, APC), Hon. Sadiq Ibrahim (Fufore/Song, APC), Hon. Talatu Yohanna (Demsa/Numan/Lamurde, APC) and Hon. Philip Ahmad (Guyuk/Shelleng, APC). In Akwa Ibom State, Hon. Emmanuel Ukote (Ukanafun/Orukanam, APC), Hon. Henry Archibong (Itu/Ibiono Ibom, PDP), Hon. Francis Uduyok (Ikot Abasi/Mkpat Enin/Eastern Obolo, PDP), Hon. Emmanuel Akpan (Ikot Ekpene/ Essien Udim/ Obot Akara, PDP), Hon. Nse Ekpeyong (Oron/Mbo/Okobo/UrueOffong/Oruko/Udung-Uko, PDP), and Hon. Samuel Ikon (Etinan/Nsit Ibom/Nsit Ubium, PDP) stand the chance to be part of the next assembly if they were successful at the polls. In Anambra State, some of the lawmakers, who have been part of previous assemblies, particularly the eight national assembly and who are in the race are Hon. Chukwuemeka Anohu (Ihiala, PDP), Hon. Azabogu Ifeanyi (Nnewi North/South/Ekwusigo, PDP) and Hon. Chukwuka Onyema (Ogbaru, PDP). There are Hon. Ferdinand Nwankwo (Anaocha/Njikoka/Dunukofia, APGA), Hon. Ben Nwankwo (Orumba North/South, APGA), Hon. Anayo Nnebe (Awka North/South, APGA), Hon. Eucharia Okwunna (Aguta, PDP), Hon. Lynda Chuba Ikpeazu (Onitsha North/South, PDP) and Hon. Chidoka Obinna (Idemili North/South, PDP). Also seeking re-election from Speaker Dogara's home state of Bauchi are Hon. Zakari Salisu (Ningi/Warji, PDP), Hon. Ibrahim Baba (Katagum, APC), Hon. Omar Tata (Zaki, APC) and Hon. Mohammed Garba (Gamawa, APC). Hon. Agbedi Yeitiemone (Sagbama/Ekeremor, PDP) is the only serving House member in the race from Bayelsa State while from Benue State, Hon. Mark Gbillah (Gwer East/Gwer West, PDP), Hon. Aja Samson (Oju/Obi, PDP), Hon. John Dyegh (Gboko/Tarka, APC), Hon. Ochepo Adamu (Apa/Agatu, PDP), Hon. Dorathy Mato (Vandeikya/Konshisha, APC), Hon. Iorember Wayo (Kwande/Ushongo, APC) and Hon. Adabah Christian (Ado/Obadigbo/Opkokwu, PDP) are in the contest against candidates of other parties. In Borno State, Hon. Mallam Gana (Kukawa/Mobbar/Abadam/Guzamalai, APC), Hon. Abdukadir Rahis (Maiduguri Metropolitan, APC), Hon. Aliyu Muktar (Biu/Bayo/Shani/Kwaya Kusar, APC), and another long serving lawmaker, Hon. Mohammed Monguno (Jere, APC) are in the race. In Cross River State, it is a major test of popularity for serving PDP House of Representatives members namely Hon. Irom Michael (Obubra/Etung), Hon. Effiong Daniel (Akamkpa/Biase), Hon. Essien Ayi (Akpabuyo/Bakassi/Calabar South), Hon. Ngoro Agibe (Ikom/Boki), Hon. Agom Jarigbe (Ogoja/Yala), Hon. Edim Eta (Calabar Munincipal/Odukpani), and Hon. Idagbo Ochiglegor (Bekwarra/Obudu/Obanliku), who are seeking re-election. It is also a PDP affair for the House members seeking re-election from Delta State vis Hon. Nwokolo Victor (Ika), Hon. Ogor Okuweh (Isoko North/South), Hon. Nicholas Ossai (Ndokwa/Ukwani) and Hon. Julius Pondi (Burutu). It is similar situation in Ebonyi State, where Hon. Sylvester Ogbara (Abakaliki/Izzi, PDP), Hon. Chukwuma Nwazunku (Ohaukwu/Ebonyi, PDP), Hon. Idunma Igariwey (Afikpo North/Afikpo South, PDP), Hon. Lazarus Ogbee (Ikwo/Ezza South, PDP) and Hon. Edwin Anayo (Ezza North/Ishielu, PDP) are having their re-election bid challenged by candidates of other parties, especially those on the APC and APGA. Hon. Sergius Ogun (Esan North-East/Esan South-East, PDP), Hon. Ohiozojeh Akpatason (Akoko-Edo, APC), Hon. Johnson Ooghuma (Etsako East/West/Central,APC), Hon. Ogbeide-Ihama Omoregie (Oredo, PDP), Hon. Ehizuwa Agbonayinma (Egor/Ikpoba-okha, APC), Hon. Omosede Igbinedion (Ovia South/West-Ovia North/East, PDP), Hon. Aisowieren Patrick (Orhionmwon/Uhunmwode, APC) and Hon. Joseph Edionwele (Esan Central/West/Igueben, PDP) are House members from Edo State, currently on the field trying to justify why they deserve the peoples' votes to return to the federal legislature. In Ekiti State, we have Hon. Akinyede Awodunmila (Emure/Gbonyin/Ekiti East, PDP), Hon. Segun Adekola (Ekiti South West/Ikere/Ise/Orun, PDP), Hon. Sunday Oladimeji (Ado Ekiti/Irepodun-Ifelodun, PDP) and Hon. Kehinde Agboola (Ikole/Oye, PDP). From Enugu State, there are Hon. Asadu Patrick (Nsukka/Igbo-Eze South, PDP) and Hon. Toby Okechukwu (Aninri/Agwu/Oji-uzo PDP) while the Federal Capital Territory has just Hon. Angulu Zakari, who represents Kuje/Abaji/Gwagwalada/Kwali on the APC platform running in the Saturday election. Other House members from the remaining states are now busy canvassing for votes in their various constituencies. Therefore, by the mid-day on Sunday, February 17, there would be clearer pictures of those who will be returning to both the Senate and the House among the current members of the National Assembly.